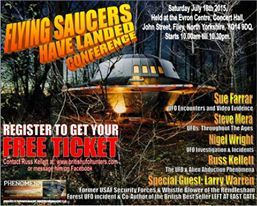 This week David Young discovered a recording he had made of Larry Warren's talk at the Flying Saucers Have Landed Conference, staged by Russ Kellet for his group B.U.F.O.H in July 2015. It's an astonishing romp through Larry Warren's imagination. Lots of changes and differences. For example; he says he was in Ipswich during the day and tested his new camera by taking a photo of the A10 in this talk. Yet just over a year later at the Earth Mystery News Conference in Toronto, he states he was in Germany that day and flew back that evening, he arrived back just in time to get ready for his shift. Some of you may remember that he stated it was Sgt Ball, Adrian Bustinza and Lt Englund who collected him from his guard post that night. Well in this talk it was Steve Longero and Adrian Bustinza!! There is so much more in it which proves he is a liar. Two talks, one year apart, completely different to all the other different versions he has told over the years. Listen to how smoothly the lies and contradictions flow through his lips. He makes references that as a Security Specialist he was 'SS' and that it was a good job there weren't any Jewish people around, because nobody thought that through did they?! Later he makes a quip that it was a time before Arabs brought buildings down! It's priceless. Then watch this Earth Mystery News interview where he skirts around answering questions, but states that he was in Germany having been chasing girls, not in Ipswich taking photos of A10s with faked UFO for company, as he states in the Filey talk. But! That photo hadn't been busted by then. Over to you Ben for your Liarry Warren Controversy part 4598. Can't wait to see how you try and waffle him out of this one. Part 7 and 8 added to the list. Warren mentions the CNN special assignment documentary and plays it during the course of his talk. Here is the actual video for you to watch. The day before Christmas, I left for Germany with my friend Mark. We had met two German girls in London the previous week at Le Beat Route, a club on Greek Street. We had gotten along well at the time, and the girls had invited us to spend the holiday with them and their families near Frankfurt. We had a great time, despite a severe language barrier. However, I think the girls lost interest in Mark and me on the second night. We just sat around and stared at their parents and they at us, while the girls went out with their German boyfriends. On or about 27 December, we flew back to RAF Mildenhall to begin our shift the next night. Robbins, Peter. Left at East Gate (Kindle Locations 1301-1305). Cosimo, Inc.. Kindle Edition.